Tag Archive | "attempted murder"
A man from Ohio, who is said to have forced his girlfriend to abort her pregnancy thru gunpoint to the head, pleaded guilty to charges of attempted murder on Thursday. Dominic Holt-Reid, a 28-year-old college student, was charged five months ago with attempted unlawful termination of his girlfriend’s pregnancy. The charges were supported by the 1996 state fetal homicide law and are considered murder in Ohio. Prosecution alleged that Holt-Reid’s old girlfriend Yolanda Burgess, 26-year-old, agreed to terminate her pregnancy during the first trimester. Burgess is also the mother of one of his six children. However, on the day of the scheduled abortion, Burgess changed her mind and this did not appeal to Holt-Reid, who earlier was convicted due to illegal possession of illicit drugs but is currently on parole. He purportedly pulled a gun on Burgess’ head and forced her to get on with the abortion. The couple purportedly drove to the abortion clinic together with Holt-Reid’s gun hidden in a band on his waist. Burgess, however, found a way to alert the clinic employees and immediately called the police leading to Holt-Reid’s arrest. Since that incident on October, Yolanda Burgess already gave birth to their child. 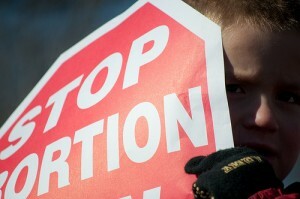 Abortion can legally be conducted in Ohio. However, it should be willfully done by the mother. Otherwise, it is considered a murder. Holt-Reid pleaded guilty Thursday on all the charges including murder, abduction, and weapons charges. Ron O’Brien, County Prosecutor, said that the man faces fines amounting to $35,000 and 20 years in jail.